Perfect amenities and location for a weekend trip. House had everything we needed! I loved that we could be on upper floor with kids and my mom could have lower bedroom with bathroom; gave us nice separation. Haven't had a rental before with such high quality linens and furnishings. Super cozy! Anchored by an ancient oak, perched on a hill just above downtown Pacific Grove, this historic Victorian has views of Monterey Bay stretching all the way to Santa Cruz. Outside, there are roses and flowering vines and multiple patios for enjoying the outdoors. Inside, a farm style kitchen —with marble counters and a bespoke AGA cookstove—is the heart of the home. You’ll wake up to ocean views in either of two upstairs bedrooms, which share a bath with a claw foot tub. A cozy third bedroom and a full bath (with a walk-in shower) are tucked in downstairs. From this location, it’s a leisurely stroll to downtown Pacific Grove, the beach and the coastal recreational trail. Stacked washer/dryer. Street and driveway parking (no garage access). Historic home with ocean views. Charming farmstyle kitchen has a bespoke AGA range and marble countertops. Living, dining, kitchen are on the first level, along with one guestroom and a full bath. Very pleased with our three night visit. Beautiful home in quiet location. Excellent amenities. We felt very comfortable. The Olmstead house was a great fit for us and our two daughters. (10,16) We enjoyed the charm of the home and the incredible ocean view. The beds were comfy and the house was clean. The only exception was the washing machine had LOTS of mold. Housekeeping should keep washer door open! I found somewipes, cleaned it out and got our laundry done. We only used the downstairs shower since the claw foot tub/shower is a bit small but that wasn’t a big deal. We will definitely rent this cute house again. The Olmstead House is a very inviting home. 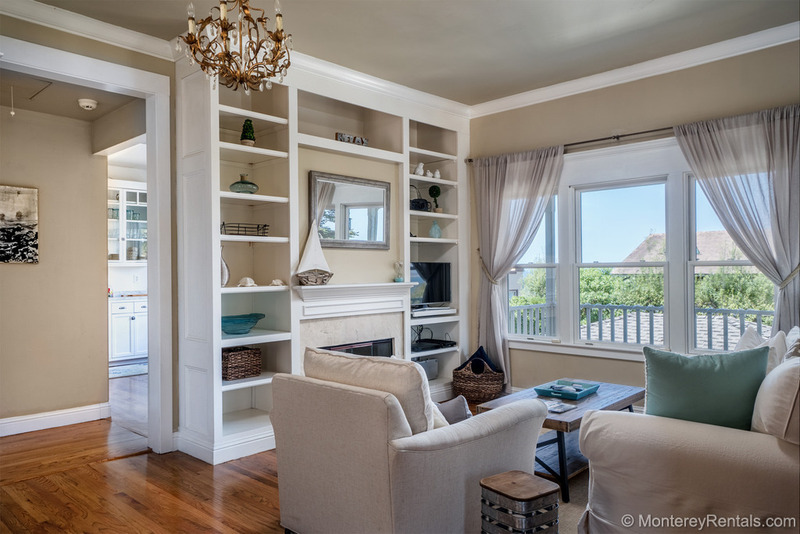 It’s beautifully furnished and very comfortable, and the ocean views are incredible! My family enjoyed gathering around the firepit in the late afternoons and visiting with cheese, crackers, fruit and wine. Then we’d cook dinner on the substantial Weber gas grill, and enjoy our meal around the spacious dining table in the kitchen with the fabulous ocean view. The living room furniture was very comfortable, too. Very nice property!!! The Olmstead House is just as lovely in person as it is in pictures. We had everything we needed and in perfect condition. Walks in the quiet neighborhood were a joy, as was whale watching from bed! The view from upstairs is spectacular. We spent Memorial weekend at the Olmstead House and we loved it!The house had everything we needed. It was well furnished. The kitchen was well equipped and everything was sparkling clean. We were apprenhensive about the AGA range, but no concerns!It was hard leaving the cozy kitchen after breakfast! !The views from one of the bedrooms was fantastic and seeing the sun rise was amazing. So get the dibs on that bedroom fast:)We were well stocked up on towels and extra bedding. We did not spend time on the outside patio but I am sure that's a nice area when the weather permits. The location was perfect, it was near to everything by car and is walking distance to the shops and beach. Wish we had more time to explore the surrounding areas.We will definitely be coming back to Olmstead House again, so much to do and see.Michelle was wonderful, she responded to emails and calls in a timely manner and was very helpful.Picking up and dropping of the key was very convenient.Thank you Monterey Management for making our stay memorable. We were in town for our friend's wedding and not only was this rental just a block from our friend's house, it was centrally located with an easy walk to all in Monterey (aquarium, restaurants etc). The house is gorgeous and loaded with character, and we had everything we needed for a perfect stay. Thank you Olmstead house! Olmstead House was adorable perfection. It was perfect for our family of 5, we would definitely stay there again if we had 7 or less in our group. We saw whales from the master a couple of times, that was a real treat. I walked to Crema for coffee and breakfast treats, it's a nice walk, and a delicious reward. This house just has so much charm, and it is so peaceful and relaxing. There was only 1 thing I would consider a concern as a mom, especially of a toddler, and that is the windows in the upstairs twin bedroom are too easy to open. With the beds so close to the windows that was a concern, so I put my older kids in the beds, and we made a bed on the floor between them for our toddler. Naptime was done on the couch downstairs with me, so it all worked out with minimal worry. I did mention it to management, I'm sure it will be addressed. This is just a concern, mom to mom, it is in no way a ding against the property, we would stay there again.